In December of 2005, Jason, a Scout Platoon medic with the Army, was en route in Ramadi, Iraq, with other soldiers from the 2-69 regiment when an explosive detonated under their vehicle. He suffered serious injuries to his neck and back, which afflict him to this day. If you ask Jason, he would probably concur, and he’s got plenty of true stories to confirm. But sometimes the nightmares people endure—violence, trauma, pain—fail to kill and overpower, and these harrowing events draw together those who survived them. Nearly a decade after the accident, Jason introduced Freedom Alliance to some of his fellow soldiers from the Ramadi platoon: Dan, Brandon, and Larry. First Sergeant Larry, injured in the explosion with Jason, spent many months at Brooke Army Medical Center in San Antonio, Texas, being treated for burns on his back and arms. 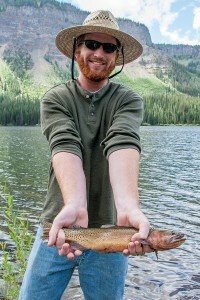 Thanks to donations from the Hengeler family in Maryland and Adams Lodge Outfitters in Colorado, Freedom Alliance was able to design a trip for Jason and the other men from 2-69 Scout Platoon, who hadn’t seen each other since their unit left Iraq. 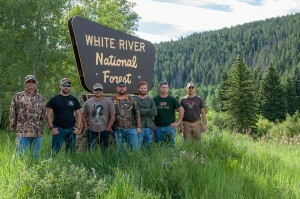 We invited the soldiers, along with retired National Guard veteran Jeremy (and Larry’s cousin), to the Flat Tops Wilderness Area of the White River National Forest in Colorado for an unparalleled fishing and camping expedition. 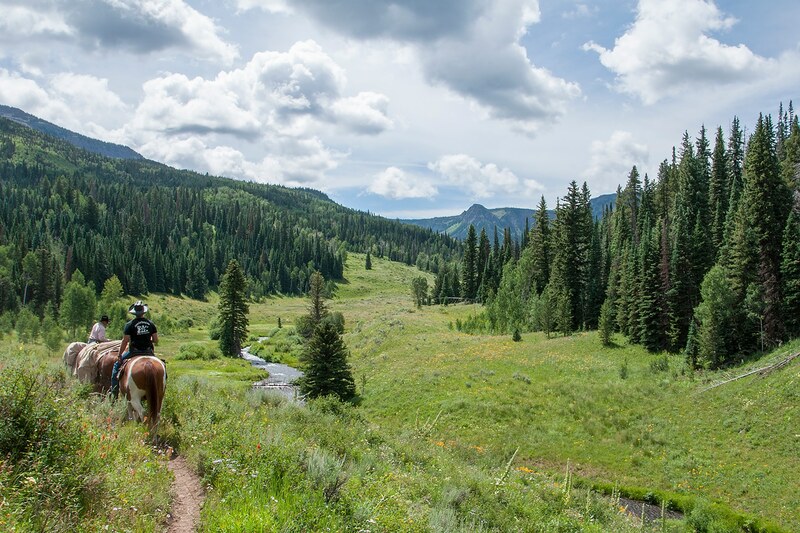 The five servicemen, Anthony, and two Freedom Alliance team members drove from the airport in Denver to Glenwood Springs for the night, in order to adjust to the increased altitude. 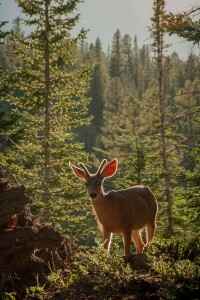 The next morning we rendezvoused with Bruce, the owner of Adams Lodge Outfitters (ALO) who donated—for the second year in a row—his guide service and camp. 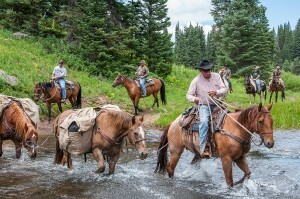 Bruce and his staff helped us divide our gear among the pack horses and mount up for the three-hour horse ride into the Flat Tops Wilderness. 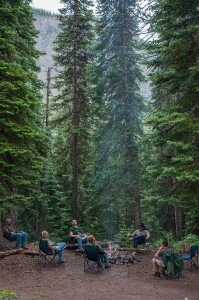 The camp was set up at Upper Marvine Lake, at an elevation of around 10,000 feet. 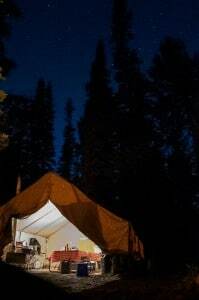 ALO prepared a fantastic setup—a sleeping tent with cots and a kitchen tent for groceries, complete with stove, oven, cooking and eating utensils, and the essential coffee percolator. After arriving and stowing our gear, the men wasted no time in grabbing their rods and trekking to the lake shore. And this was the routine for the next few days: multiple hikes to the lake to fish for trout, only returning to camp for meals and rest. 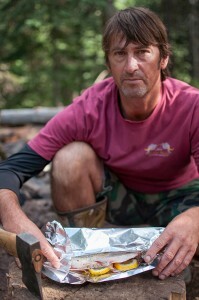 As well as being our point man, Jason was the camp cook. And although he is pursuing a degree in nursing, you would think he was professionally trained in culinary arts. 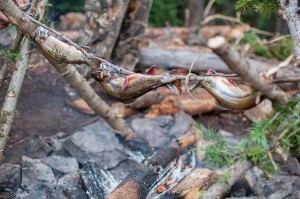 The men assembled a spit over the campfire, and Jason smoked the trout they caught, in addition to cooking chicken, steak, and hamburgers. Along with tasty meals and lots of time with lines in the water, the vets also liked to sit around the fire with mugs of coffee and cigars. It was here that they reminisced, sometimes with a chuckle and sometimes with creased faces, about their stint in Ramadi—a hell that we daresay lost some of its potency in this immaculate, aspen-lined Garden of Eden—but only they could say for certain. It seemed like before we knew it the last day had dawned, and Bruce and the team from ALO came to pack up camp and steer the soldiers back toward civilization. It was a bittersweet ending, but we don’t think the men will soon forget their time together. Countless thanks go to Bruce of ALO and the Hengeler family for working with us to give an awe-inspiring journey to these five servicemen. You are not your memories. You are your dreams.